“What? 12 minutes? 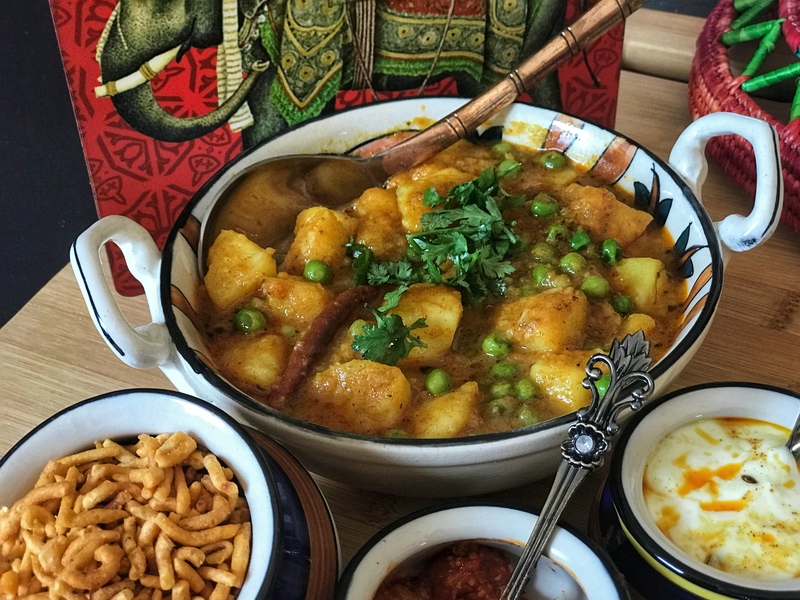 Are you kidding me?” This was my son’s reaction when I made this flavorful, spicy Indian curry; aloo matar in the Instant Pot for him. Instant Pot is a new appliance in my kitchen and trust me, it not only cooks food fast but is also making me a SUPER MOM 🙂 🙂 I am just loving it! The curry that I tried in this is a very popular and simple one, and it doesn’t require much planning. The main ingredients for this curry are potatoes, peas, and tomatoes, which are effortlessly available at every grocery store. This curry features classic Indian masalas like cumin, kalonji, mustard seeds, and fenugreek seeds. The tamarind and tomato puree gives the desired tangy flavor to the dish and the last kasturi methi makes it super aromatic. It is super easy to operate Instant Pot and quick to make the aloo matar curry in it. The curry really goes well with rice, roti, or quinoa and is a complete meal by itself with some very basic preparations. So, on weekdays when you get home late from work and crave to eat something hot and hearty, then the Instant Pot aloo matar is the way to go. With Instant Pot in your kitchen, a quick and delicious meal is always at your fingerprints! 12 minute Instant Pot Aloo Matar - a spicy, flavorful potato and peas Indian curry which is a great meal option for busy weekdays. Press the sauté mode button on instant pot. When hot, add oil, cumin, fennel, mustard, onion seeds mixture, hing, dried red chili, bay leaves, ginger, green chilies and let them sizzle for few seconds. Add tomato purée, red chili, coriander and turmeric powder. Sauté it for 1-2 mins, then add potatoes, salt and water. Lock the lid. Select manual button and set it 7 mins on high pressure. When cooking is complete, quick release the pressure and open the lid. Now, put it on sauté mode again. Add peas , tamarind paste, garam masala and mango powder. Crush kasoori methi between your palms and add it. Saute for 3-5 minutes. Garnish it with cilantro and enjoy! Cut the potatoes in 1" to 1.5" pieces. If you cut them smaller, they will turn mushy. To thicken the gravy, you can mash a few of the cooked potato pieces from the curry. It’s one of of my favourit dish. I love to eat this with Puri or Parantha with combination of Mango Pickle & Curd. It’s really so awesome & yummy. I hope you will like my today’s post about Healthy Mint Paratha https://theamazingguide.com/2018/08/08/healthy-indian-bread-pudina-paratha-yummy-recipe/ Plz like. Thanks. Thanks. I picked it up from Amazon. Hi Nidhi, thanks so much for sharing this recipe with us. This was my first time using my instapot and your recipe made the experience all the better. Everyone loved how the aloo Matar recipe turned out. Easy, quick, and delicious! !